Artists Lillian Pitt (Warm Springs/Wasco/Yakama) and Dan Friday (Lummi) display their glass art creations, which were made collaboratively at a multi-day glass blowing event earlier in 2018. 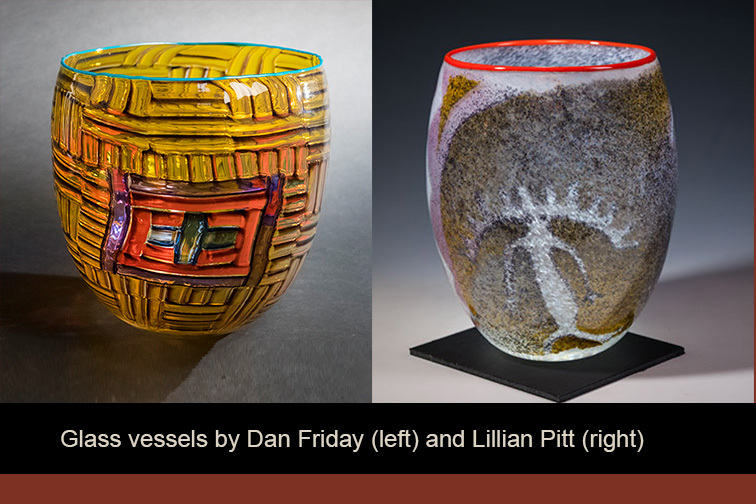 Their creations are in the form of glass baskets or vessels, that were blown and fused by Dan Friday under the direction of honored-elder artist Lillian Pitt. Dan brought over twenty years of glassblowing experience to the collaboration, and Lillian brought the aluminum stencils based on Columbia River and Plateau designs that were incorporated into each piece. By the end of the process, the two artists had fused their concepts and visions together into a brand new series of rich, vibrantly colored vessels that reflect time-honored images from the artists’ ancestors. Dan Friday is a member of the Lummi Nation and a Seattle based glass artist. He has spent the last twenty years working for artists such as Dale Chihuly, Paul Marioni, Preston Singletary, and many others. Dan has also taught at the Pilchuck School of Glass. He has had residencies at the Museum of Glass in Tacoma, WA, and the Dream Community in Tai Pei, Taiwan. In addition, Dan is a recipient of the Discovery Fellowship through the Southwestern Association for Indian Arts. His work can be seen in galleries across the United States. Lillian Pitt is a Pacific Northwest Native American artist whose ancestors lived in and near the Columbia River Gorge. The focus of her work is on creating contemporary fine art pieces that delight today’s art lovers, and at the same time, honor the history and legends of her people. Lillian works in a range of media, including clay, bronze, glass, mixed media, and jewelry. She has been the recipient of numerous art awards and awards of distinction for her efforts to help educate people about Native American lifeways and traditions.